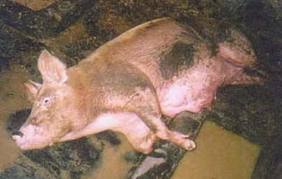 Aizawl, Apr 29 : Over 500 pigs have died in Mizoram due to swine fever in the last two months. According to report from Animal Husbandary and Veterinary department officials, the number of pigs died due to the endemic "Classical Swine Fever" has crossed 500 mark since the month of March. Officials said, the endemic swine fever caused the death of as many as 465 pigs in Aizawl district alone, while another 11,163 pigs are reported to have been infected with the disease. More than 200 piglets of the New Land Use Policy (NLUP) beneficiaries also had died due to the disease. The officials however expressed optimism that the 'Classical Swine Fever' will be contained soon. The AH & Vety officials also informed that besides 'Classical Swine Fever' another disease is known to be spreading in the neighbouring Burma which is called PRRS (Parcine Respiratory & Reproductive Syndrome), and the same is suspected of spreading in Mizoram too as some of the infected pigs have the symptom of PRRS. However, it is not yet ascertained, as the officials informed that that test is being conducted at Selesih Veterinary College after which they will send the samples to a laboratory in Bhopal for confirmation. Meanwhile, consumption of pork in Mizoram and Manipur have become less following the outbreak of swine fever. Imports of pigs from Myanmar to Mizoram has been restricted following the outbreak of the swine flu. Restriction on selling of 'affected pork' by the administration continues in the state capital Aizawl for the past one month and this restriction will continue till May end. Owing to the spreading of flu among the pigs in Aizawl area in the past one month which has been proved to be 'Classical Swine Fever', the Sub-Divisional Magistrate, Aizawl Sadar Sub Division, Aizawl here has been imposing certain restrictions regarding selling of pork in the market and related activities. As the news of the spread of pig flu spread, the denizens of Aizawl have started avoiding their delicacy. The sales of pork also dropped rapidly. Chicken and beef have been substituting the menu in marriage feasting these days. As reported earlier, taking advantage of the situation, the dealers have hiked the price of chicken. Prior to the detection of the swine flu chicken (dressed) was sold at Rs 180 per kilogram but these days it has risen to Rs 250 or more a kilogram in Aizawl. The 'Classical Swine Fever' was detected after examination at Laboratory of College of Veterinary Science & Animal Husbandry in Selesih last month. Following the detection, vaccine is being administered free of cost to uninfected pigs for prevention of further spread of the disease. However, butchers shall have to possess Acknowledgement from Local Council/Village Council and Vety Director, along with certificate on the health of their pigs. In case of any death of pig due to swine fever, the owners are to bury immediately with the acknowledgement of their respective Local Council/Village Council. The restriction is being made following the direction of Director of AH & Vety Deptt. vide No..D30017/1/99-DTE (AH&Vety) on March 22 . The Sub-Divisional Magistrate, Aizawl Sadar Sub Division, Aizawl has imposed the restriction in exercise of his power under Section 144(4) of G.P.C. (Act II of 1973) . The restriction will be effective during two months from the date of notification, within which any violator of the restriction shall be punished as per the above-mentioned law.